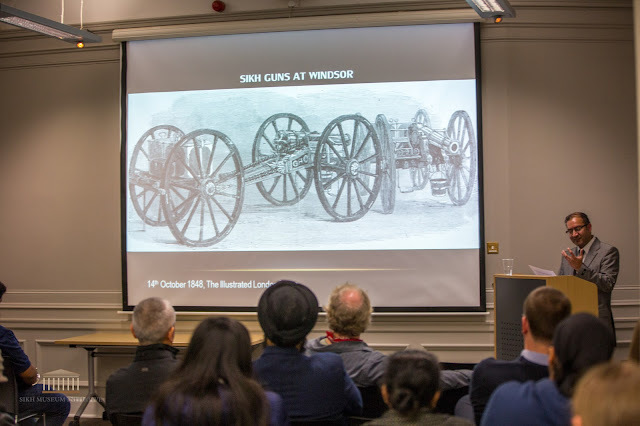 A special lecture on Sikh Arms and Armour took place on 18th October 2017 at New Walk Museum, Leicester. 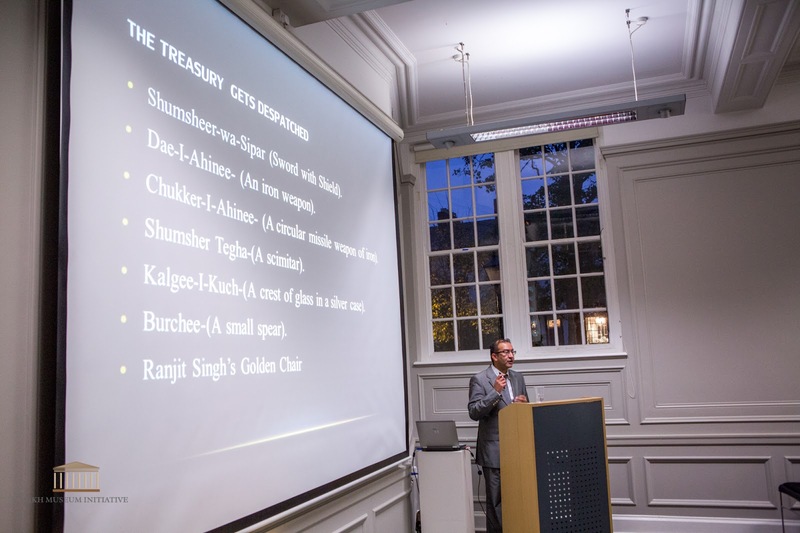 The speaker was historian and author Gurinder Singh Mann also head of the Sikh Museum Initiative. The lecture was part of the exhibition Splendours of the Subcontinent: A Prince's Tour of India 1875–76. Sikh cannon captured during the Anglo Sikh Wars and put on display at Windsor Castle. The Royal Collection Trust houses the collections of the Royal Family in the UK, Mann was given access to certain materials within the collections for the lecture. The talk was based on how Sikh relics and artefacts found their way into the Royal Collection. It was introduced by Dr Malika Kraamer, Curator of World Cultures at New Walk Museum. 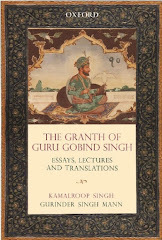 Mann started with the how the toshkhana (treasury) of the Sikhs was built up from the time of the Misls to the treasuries at Lahore and Amritsar under Maharajah Ranjit Singh. He stated that after the Anglo Sikh Wars (1845-1849) much of the toshkhana was disbanded and many items made their way to the UK. This include the Koh-i-noor diamond and the Timur Ruby. 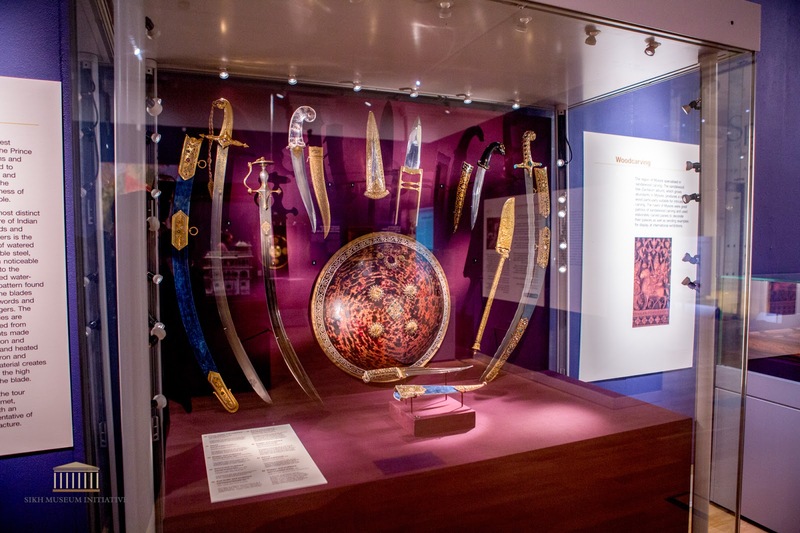 However, several items whilst dispatched to the UK never made their way to the Royal Collection this included the swords of Guru Gobind Singh namely the Toshkhana and Reekote swords. Sikh treasures taken by the East India Company after the annexation of the Punjab. However, the main part of the talk centered on the gifts given by the Maharajah’s of India to Prince Edward (later King Edward VII). The Prince visited the Punjab in 1876 and was received at Lahore and Amritsar. It was on these occasions he was given a number different sets of Sikh arms and armour. These splendours were gifted by the Maharajah Mahendra Singh(Patiala), Maharaja Raghbir Singh (Jind), Maharaja Bikram Singh (Faridkot), Maharaja Hira Singh (Nabha) and Kharrak Singh (Kapurthala). They were the some of the finest treasures seen by the British. Maharajas of the Punjab who gifted numerous items to Prince Edward as part of his tour in India. Mann discussed the different types of Sikh weaponry in the Royal Collection including a number of swords (talwars), quoits (chakkars), shields (dhal), breastplates (chariana), helmets and other treasures. Mann stated, ‘These Rajas had much at stake to ensure they maintained their hegemony and the status quo. 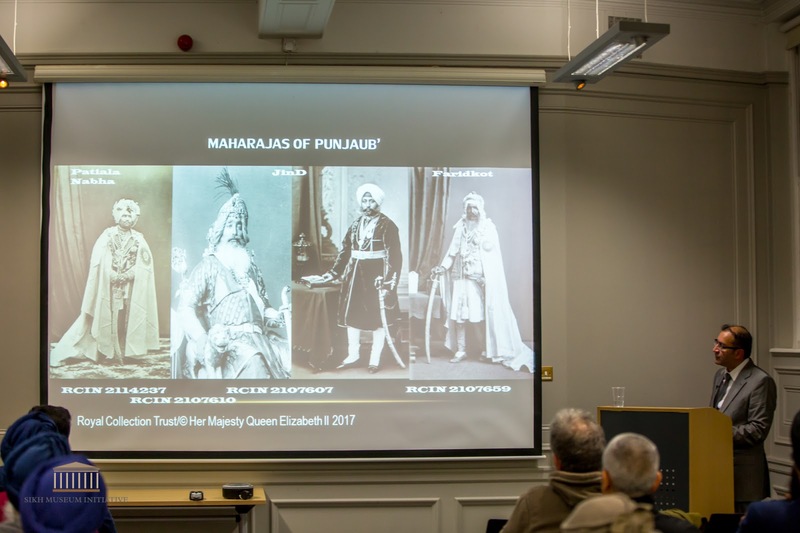 So the gifting of treasures to the ‘Empress of India’- Queen Victoria via Prince Edward became a lavish affair.’ Once the treasures arrived in the UK they were exhibited in exhibitions and the public learnt about the highly developed techniques of Indian weaponry. The treasures also made their way into other museums across the UK although the many of these items now reside at the Queens’s estate at Sandringham House and Estate in Norfolk as well at the Windsor Castle and the Tower of London. A number of arms and armour gifted by the Maharajas of India.The shield in the middle was gifted by the Maharaja of Patiala. The lecture was followed by a Q and A session, together with the the participants a receiving a special tour of the Splendors exhibition which was appreciated by all that attended. The Sikh Museum Initiative touchscreen monitor was also exhibited showing the relics 3d modelled as part of the Anglo Sikh Wars exhibition. Photos courtesy of Punjab2000 Objects part of the Royal Collection Trust. I would have loved to attend a seminar or lecture like this because of my love for all things historic. So thank you for a mini update like this.